In 1999, The Department of Agricultural Economics, Economics and Sociology started an associated Department of Anthropology. In order to commence the department, the competent authority desired to develop the scheme of studies of masters in Anthropology. The said scheme was developed by a committee comprising of the Chairman of Agricultural Economics, Economics and Sociology, the learned Faculty of Anthropology Department of Quaid-i-Azam University, Islamabad to supervise. The Academic Council of the University approved the Scheme of studies and this department started functioning in 1999. The first batch was enrolled in the year 2000. In 2004, both master programs in Sociology and Anthropology were separated from the Department of Economics and Agricultural Economics. The schemes of studies of both the disciplines were revised in the year 2010 to make the programs more responsive to meet the present demands of the degree program and professional market which is in practice till date. The program of Anthropology aspires to provide the essential skills in understanding the developmental issues of Pakistani society particularly the rural Pakistan. The existing curriculum targets the needs to have dynamic and progressive social scientists particularly in the domains of Anthropology to address the emerging socio cultural issues in Pakistan. Moreover, the department plans to initiate the M Phil program, from the year 2015, due to the colossal demand within the academic sector of a new institution, due to unavailability of any public institution accept Quaid- i- Azam University in Pakistan. 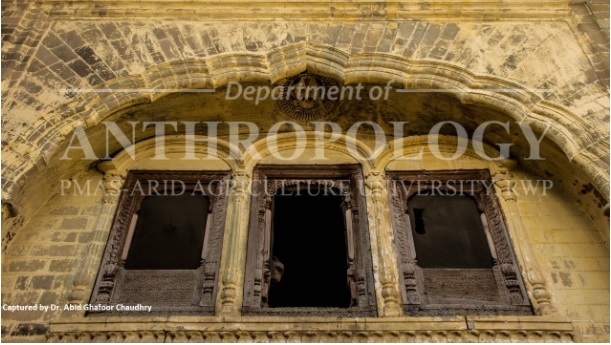 The program provides a variety of important sub disciplines for instance Archaeology, Socio-Cultural Anthropology, Linguistics, Physical Anthropology, Indigenous Knowledge and traditional wisdom, past societies, Political Anthropology, Religion, Global Cultural Transformation, Perspectives on Development, Anthropology of Pakistan and South Asian Societies. The program builds on their knowledge in such a way that initially they are oriented towards the discipline and then courses from all the major subfields of Anthropology are taught. Students do have optional and minor courses from within and outside the department. They are equipped with extensive training on research through field assignments and courses designed specifically on research and theory. Moreover, students are strategically encouraged to develop their professional writing skills through assignments focusing on writing research paper. In the final semester, the whole focus of the degree i.e. research is undertaken by the students. It compromises of at least a 4-6 months extensive field work and later the thesis reports are prepared. The whole exercise is supervised by the faculty. It gives them basic societal understanding and insights to furnish the professional abilities. It also educates graduates to better understand and contribute towards the developmental and progressive needs of the society. To prepare students for careers requiring acquisitions, acquirements, cognition, and noesis from a synthesis of the natural and social sciences. The department and its faculty strongly believes that beneficiaries and students in anthropology are generically thinking beings who are expected and supposed to expose and demonstrate their innate depths of intellect, efficacious reading and authorship and the ability to become problem shooters spanning the humanities, natural sciences and the cultural diversity characteristic of the modern world. The program bridges the gap between major stakeholders i.e. NGOs and INGOs, academic realm and R&D sector. Department is currently planning to initiate orientation sessions at undergraduate level intending career counseling that shall broaden the awareness of the subject's academic and practical significance. To frequently shape new courses as per the developmental needs and academic requirements of the discipline and introducing them in new scheme of studies. Focusing the research over arid areas of Punjab, in line with universities mission, be used as course material for designing new courses in the next scheme of studies or publication material. To build department's image as a research center, attracting all the major stakeholders including Government departments, organizations and agencies, international donors, international non-governmental organizations, national level NGOs and other civil society organizations forming a nexus that will lead to the development of a functioning cell for generating solutions for social issues and student's professional grooming. Awareness about the subject's subject matter is necessary to make the communities more responsive in terms of enrollment in both masters and MPhil level. Inclusion and restructuring new courses as per the global trends introduced in the discipline. The focus shall be now on the applied and socio-cultural aspect that will help the students practically be involved in the professional mainstream. Compiling the demographical ethnographic data attained through the research objectives can serve as an opportunity to highlight the issues of the Potohar region through reports and publications which will be later used to shape research projects. Engaging students in various research projects being carried out by different agencies by enhancing their exposure to different development initiatives. Further involving them in research, publication, and other professional activities to advance the discipline and disseminate information to both professional and lay audiences. Involving community educational institutions in awareness sessions will lead to assimilation of motivated, fervent and productive students increasing and adding to the mass of enrolments. Striving to design courses informed by anthropological perspectives, indoctrination of students in the global mainstream of the discipline.